Ethicon Physiomesh blamed for injuries following Hernia Surgery according to a lawsuit. Amy Flood from Texas recently filed a product liability and personal injury claim in the U.S. District Court for the Eastern District of Texas over injuries caused by an Ethicon Physiomesh hernia mesh. Ethicon Physiomesh blamed for injuries following Hernia Surgery. Ethicon Physiomesh and Proceed Hernia Mesh linked to infections, failure of the device, serious injuries including bowel perforation according to many lawsuits. According to Flood, the Ethicon Physiomesh mesh is defective leading to increased risk of adhesions, bowel perforations, erosions, fistula formation, bowel strangulation and hernia incarceration. 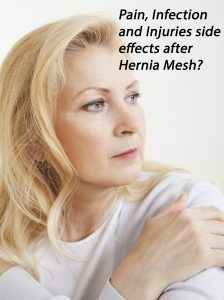 Ethicon Mesh caused bowel perforation according to a lawsuit. Ruby Caveeck from Pennsylvania recently filed a product liability and personal injury claim in the U.S. District Court for the Western District of Pennsylvania over injuries caused by an Ethicon Proceed hernia mesh. According to Caveeck, the Ethicon Proceed mesh is defective leading to increased risk of adhesions, bowel perforations, erosions, fistula formation, bowel strangulation and hernia incarceration.